The brutal attack of American invaders of Saturday 3rd October 2015 on a hospital in Kunduz province – supported and operated by Medicines Sans Frontiers or Doctors Without Borders – in which nearly one hundred patients, their attendants, doctors and other staff members were martyred and injured is an explicit war crime according to all Geneva Conventions and international humanitarian laws but the barefaced American authorities ruled it a mere human error. In regard to this explicit war crime, the Pentagon said that it was an unintended mistake as the ground operators and the crew aboard an AC-130U gunship were unaware that they were firing on a medical facility therefore it did not amount to a war crime. But the head of Medicines Sans Frontiers clarified that they had contacted the command center of American forces at the beginning of this half hour attack and informed them that their hospital was under airstrikes. In response to this briefing of Pentagon officials, the communique of MSF clarified that the American forces attacked their hospital health facility in violation to all international humanitarian laws therefore this brutal attack cannot be considered a mere human error rather it was an explicit war crime and the perpetrators should be trialed as soon as possible. The puppet regime of Kabul expressed their gratitude by supporting the recent ‘investigation’ of Pentagon regarding the attack on MSF health facility. General Joseph Votel, the head of US Central Command said – in a mocking justification of their brutal attack on this hospital – that military personnel were exhausted due to incessant fighting and finding accurate ground information was a difficult task in such a situation. This ridiculous justification of Pentagon insinuates that if exhausted, one can go to any extent and can violate law and it won’t amount to a war crime. Secondly if getting accurate ground information is not possible, then the bombardment and destruction of civilian houses, mosques, hospitals and other public facilities and the indiscriminate killing of innocent people do not mount to war crimes as well!!! It is only a ridiculous justification by the brutal forces who call themselves modern civilized nations of the world but are actually following the policy of ‘might is right’ in real sense of the word. Human rights and values are significant for foreign invaders, the stooge Kabul regime and their sponsored media outlets and civic societies when their own military, political or economic interests are at stake; otherwise they do not realize any human right or human dignity rather they approve and support the violators of these values. Inside Afghanistan, it has been frequently observed that innocent civilian people are killed, injured, incarcerated, their houses and places of worship demolished, large gatherings, funeral processions and wedding ceremonies indiscriminately bombarded but neither has the judicial organs of civilized world raised their voices nor have the cries of these oppressed people been heard by any internal so called independent media resources and civic societies. 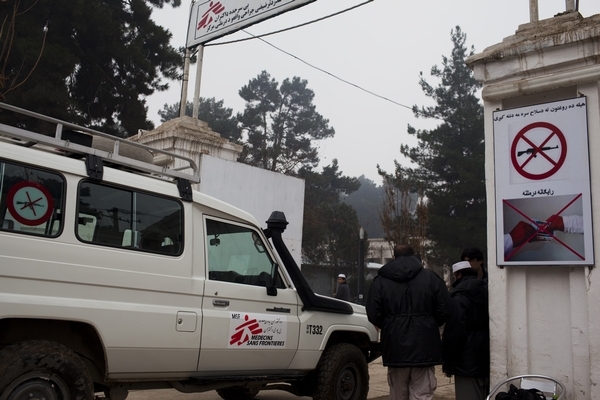 The brutal attack on MSF in Kunduz can never be justified or considered a mere human error. It was a clear violation and an explicit war crime as it was a deliberate and planned attack. From the very beginning, both the savage American invaders and their stooge regime in Kabul were defending this ruthless attack as a significant success by saying that injured Mujahidin personnel were the ones targeted and killed in this brutal attack. In reality they had inflicted irredeemable losses and casualties on helpless civilian people and the devoted doctors and staff members of this hospital which was the only well-equipped health facility in this area!! !